In March of 2005, Kyle and I drove the country roads through Aberdeenshire (Aberdeen— Obar Dheathain, “confluence of two rivers”—the Dee and the Don; Aiberdeen in Scots), and were fortunate to spend time at both the cairns of Loanhead of Daviot and Easter Arquorthies without interruption. Loanhead of Daviot has a diameter of 67 feet (20.5 m) and dates from (about) 2500 BC. The recumbent stone and its pair of flankers stand just inside the line of the circle, which is made of eight equally spaced standing stones. The recumbent stone was thought to be a double stone, but was found to be one stone that had been split by the elements. The stone beside the east flanker has a line of five cup marks on its inner side. Excavations showed charcoal and broken pottery shards around the bases of the standing stones, indicating single burial cairns at each one. In the middle of the circle is a low Bronze Age cairn with a rectangular mortuary pit. An 850 sq ft (88 sq m) circular-banked cremation site and cemetery from the same time is located nearby. I did not feel much connection to the Loanhead of Daviot ring of stones, but Easter Arquorthies was a different story. Located down a long lane away from the car park, it stands upon a hill of open fields. As I walked the lane, I could feel myself walking back through time and I was wishing I was on horseback riding across the fields. The placement of the stones was dynamic, with the twelve-and-a-half feet long recumbent stone lying altar-like and anchoring the energy. The circle is 64 ft (19.5 m) in diameter, made of nine stones set in a low bank. In front of the recumbent are two huge blocks of stone perhaps placed for ceremonial purposes. Some of the stones here have been shaped: the recumbent stone’s outer face has been worked smooth, and there is a diamond-shaped stone and a waisted, rectangular stone. This site has not been excavated, so it isn’t known whether or not there is a central cairn. There is a rise in the profile of the interior which suggests there may have been one. A few days later, Kyle and I stood in the middle of the area known as the Balnuaran of Clava, (Clava Cairns) a group of burial cairns that were built (about) 4000 years ago in what is now Strathnairn (Gàidhlig: Strath Narrann, “Valley of Nairn”) southeast of Inverness (Inbhir Nis, “Mouth of the River Ness”) near Drunmossie Moor otherwise known as Culloden Battlefield (Cùl lodain, “back of the small pond”). As we watched a few children climb all over the cairns, he quietly remarked that he was glad he had been taught to have respect for ancient things. We waited patiently, and soon the family was packed in to the car and we had the grove to ourselves. Kyle and I wandered quietly around the Clava Cairns and its central standing stone ring, and I was particularly drawn to the one cairn. Located in the North-East part of the area, its entrance faced in toward the center ring, and it looked easy enough to just walk through the passage in to the center of it. Kyle was adamant that I not do it. He had no reason that he could explain other than to say that he knew that I shouldn’t do it. In the 19 years that he had been alive, I had come to know his acute intuitive sense and so I stayed outside the ring of standing stones that surrounded the cairn. The closest I went to the center of the cairn was to align myself so that I could take a photo looking down the passage. The cairn intrigued me and the photo became one that I loved both for its simplicity and the memory of the energetic draw I felt when standing there. A year later, I was standing at the Clava Cairns once again. I was with my dear friend Carolyn who is, among other wonderful and creative things, a dowser. As she and I traveled throughout Scotland, she read the land and found the ley lines coursing through the countryside. As I had with Kyle, she and I found ourselves quietly walking our separate ways through the area. At one point, I looked up to see her standing inside the North-East Cairn. I walked over and waited for her to make eye contact with me, and then asked how it felt to be in there. She said there was some energy flowing and she felt “a little buzz” but that she thought it was all right for me to come in. I threw Kyle’s cautionary words to the ever-present Scottish winds, and walked over to the entrance of the passage. I felt the energy begin to move through me as I passed through the outer ring of standing stones. When I came to the outer edge of the passage, I stepped across what would have been the threshold and was met with a sharp blast of energy that threw me up against the stones and then pushed me out. It happened so quickly that I may not have believed it except that I had a witness who was amazed, and a bit concerned at how hard I had landed when I hit the ground. As it turned out, I also had a couple of bruises as a reminder. Archeology tells us that the Clava Cairns were built around 2000 BCE. There may have been two more in addition to the three that are still standing today. There were farms and a settlement at the site before the cairns were built, and some of the stones used in the cairns may have come from the stone houses. Other cairns, such as the one at Corrimony in Glen Urquhart, show that only one body would have been placed in the central chamber of each cairn. The Clava Cairns were used again around 1000 BCE, and a few more burial monuments were built in the area. The grove of trees around the site was planted in Victorian times in honor of what they thought was a Druidic sacred place. Of the three cairns that still remain, two are chambered and the central one is a “ring cairn” which is open at the center but has no passage. This type of cairn was most likely used as a pyre. The circle is made of two rings, or kerbs, of stones of various heights, colors and textures that are filled in between with stones placed as “rubble banks”. The standing stones around the perimeter of the ring are also of different colors, heights and textures. There are “cup marks” on the outer face of one of the standing stones and on some of the outer kerb stones. This Central Cairn stand a little off to the side so that it is not in direct alignment with the other two cairns, and it does not block the view between the North-East one and the South-West one. Both the North-East and South-West Cairns would have been enclosed, domed structures. The North-East Cairn would have been about thirteen feet (4m) high at the center. As with Maes Howe, the passage was low and one would have had to stoop very low or crawl through it to get in to the center. The kerbs were originally a design of red and white stones with some cup marks on a stone on the outside. The ring of standing stones that surrounds the cairn is also in a design of red and white stones. Again, as with Maes Howe, the passage is aligned so that the rays of the setting sun on the Winter Solstice shine directly down the passage and on to the opposite wall of the cairn. The South-West Cairn has the same alignment, and the setting Solstice sun would have illuminated the wall of it as well. This cairn is placed in such a way that, when it was viewed from the North-East Cairn, the sun would have looked as though it were setting on the top of the cairn. This cairn is also decorated with cup marks and on some of the stones the marks were made before the stone was placed. I walked around for a little while, getting myself grounded and when she sensed that I was ready, Carolyn offered to do some dowsing and see what she could read about my particular connection to these Cairns. We stood for a long while and I am happy to have thought to get it all on video because she revealed a lot and I was deeply affected by the information she shared. The energy between the land and my soul has been made strong by multiple lifetimes. I was able to feel the pulse of the ley lines that intersect at Clava Cairns, but the time was not right for me to be able to enter the sacred space of the North-East Cairn. When we left, I was energetically exhausted and elated at the same time. Here, I realized, is the heart of my connection with Scotland. I share this because I write about the trips I have taken to Scotland. I write about the wonderful things I have seen and done there, the fine whisky and the great food, and the love that I have for the country, the people and the land that they are made of. I wanted to write, even if just this little bit, about the depth of the connection, and that, while my ancestry is certainly strong, my connection is even stronger than “ancestral memory through Scottish bloodlines”. 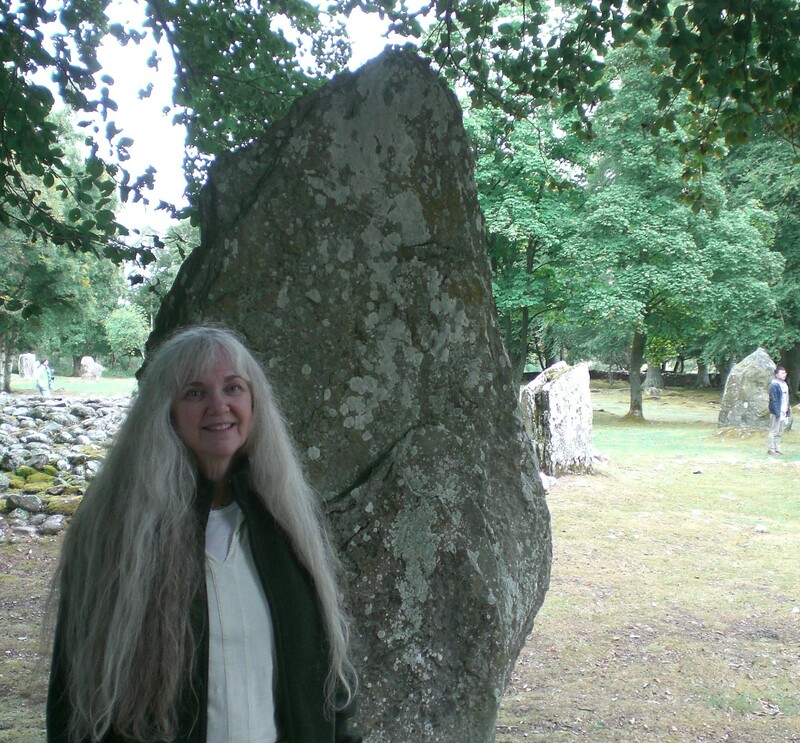 This entry was posted in Ancestry, Eco-travel, Ecology, Scotland, Scottish ancestry, Self drive Scotland tours, Travel, Uncategorized, Women Writers and tagged Balnuaran of Clava, Clava Cairns, ley lines. Bookmark the permalink.